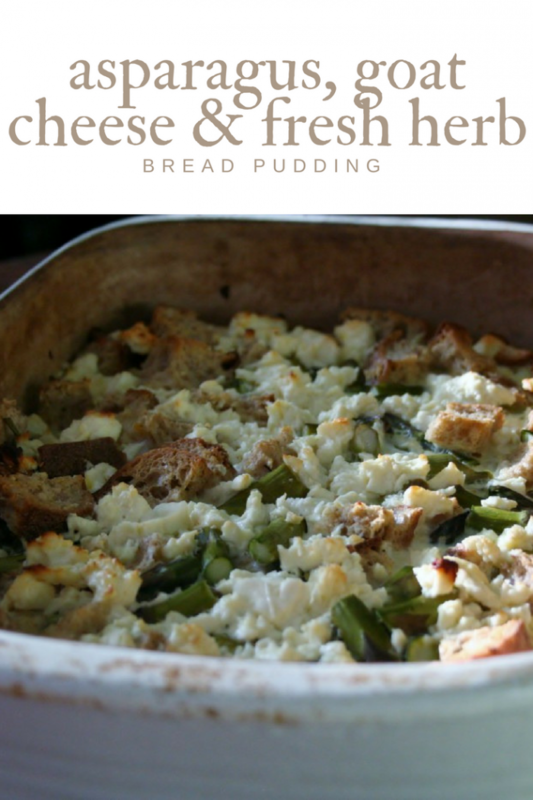 This week’s Sunday Supper theme is meatless casseroles for Lent, and this asparagus, goat cheese, and fresh herb bread pudding is a fast and easy recipe for a weeknight meal or special weekend breakfast. I really need to separate my cookbooks into two piles: One indexed in Eat Your Books, and the other not indexed. I was looking for main dish asparagus recipes and wasn’t finding anything. Then it occurred to me to check the cookbooks that weren’t indexed. I found what I was looking for in Prairie Home Cooking: 400 Recipes that Celebrate the Bountiful Harvests, Creative Cooks, and Comforting Foods of the American Heartland (America Cooks). Steam asparagus until just tender, about 3 minutes. Mix asparagus, herbs, and bread together and place in a 9x13 baking dish. Crumble the goat cheese over the bread mixture. In a separate bowl, whisk together the eggs, milk, salt and pepper. Pour over the bread mixture and bake at 350F for 45-50 minutes or until golden brown and the custard has set. Serve hot. The Verdict: I was a little concerned that there might be too much goat cheese. When it was baking, it smelled really strong. However, it wasn’t overpowering at all. The asparagus and goat cheese went together well. Even DH liked it – although he did add a little Parmesan cheese on top. It’s a great cool spring day comfort food. Hello! Just stopping by from SITS! I’m not into Asparagus, but I think this would be awesome subtituting with Broccoli! Love the post! 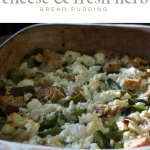 Cool idea, I love the idea of a savory bread pudding. I haven’t used Eat Your Books, I wonder what percent of my cookbook collection would be included? I have thought about photographing my cookbooks and using a computer program I have, DevonThink, to index them, but I haven’t gotten to that project. Looks delicious and healthy kind of food I want to try it now..Thanks for sharing..
Wendy, I love the idea of making this into a bread pudding! It will make a great side dish too! This sounds lovely and perfect comfort food for spring! Love that flavor profile. Perfect for Springtime.